Bowie Limousine presents one of it's most irresistable limos. 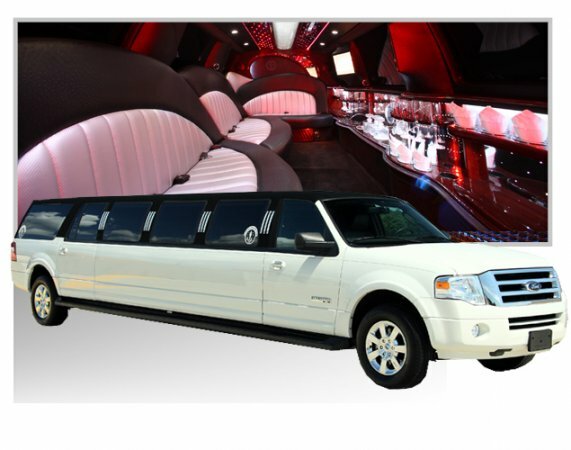 Swing through DC, Maryland or Virginia in our popular 14 passenger Ford Expedition Limo holds up to 14 of your closest friends and special guests. Big Wedding Party, Graduation Celebration, Bachelor/Bachelorette or Family Reunion. Our stretch Expedition Limousine holds the key to good times and memories of laughter. Black osterich perimeter J-seating, vibrant ceiling lighting, a bar stocked with champagne glasses and drinks, high tech tv/dvd player, VIP lounge with flat screen tv and bar and a host of other features that will wow the crowd. Elegance is the name of the game with this highly sought after SUV limousine. The versatility of this limo is incredible. Travel to a Redskins game, or an Art Museum in DC or pick up a big group from Dulles Airport in Virginia and then tour one of the many Virginia Vineyards. This budget friendly limousine option is professionally outfitted with licensed drivers who are very familiar with the Metropolitan local area. Let our professional Bowie Limousine team set you up for style today.